These high-strength hanging strips (12 position clip strips) have an easy packing facility (Quick-Fold system), allowing you to pack products tightly inside a box. 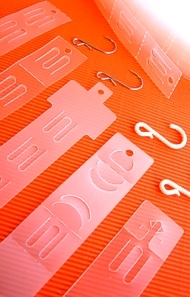 These clip strips hang and display products with the option of having a Display Card in place, promoting your brand and product information. 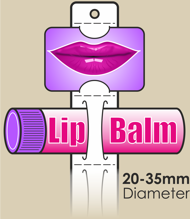 Slot height for display cards: Small (3.5cm), Medium (4.5cm), Large (5.5cm), Extra Large (6.5cm) & XXL (7.5cm). 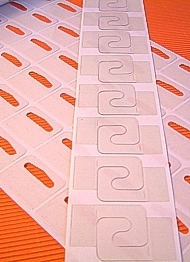 The large circular slots can hold business cards (size 5.5cm x 8.5cm), unlike the other Clip Strips available on the Market. When you purchase 1'000 pieces of our NAKWIK04 design, we can print high quality display cards, starting from £50 / 1'000. Our design team will create the layout free of charge. Please call for this service: 01243 672267. Copyright © 2019 Clip Strips Privacy Notice | How To Order | Authored and Maintained by Zetasoft Ltd.